As political crisis turns into civil war, Yemen’s embattled president, Abd-Rabbu Mansour Hadi, has appealed for international help. Yemen’s northern neighbour, Saudi Arabia has been very nervous about both Bahrain and Yemen uprisings, unfolded since 2011. Regime in Riyadh unconvincingly warns it will "take necessary measures if needed” and currently the Saudis are reportedly grouping artillery and other heavy military equipment close to the border. Most observers agree, this move is a show off made for the domestic Saudi consumption, to prevent panic and demoralisation. Almost constantly since its foundation in 1932, Saudi Arabia has been involved in Yemen politically, and sometimes militarily – far too often with negative consequences for Yemen. Is the increased Iranian influence in Yemen a game changer? Could this ultimately lead to a complete dissolution of Saudi Arabia as a state? Is (con-)federalisation of Saudi Arabia the best long term option? Just two years after establishing Saudi Arabia, Ibn Saud fought a brief war with Yemen. Details of the conflict are not particularly relevant today but its result was the Treaty of Ta’if which for the first time formally demarcated part of the border between the two countries. This was the westernmost part of the border, adjacent to the Red Sea, and in the process several ethnically Yemeni areas became Saudi territory. However, because on kinship ties on both sides, and other factors such as animal herding, the border proved difficult to control. By the time of the oil boom in the 1960s and 1970s, this had resulted in countless Yemenis working in Saudi Arabia. Northern Yemenis were allowed to enter the kingdom on terms which were easier than those for nationals of other countries (including the southern Yemen). They had no need for a Saudi sponsor, and were allowed to own businesses without the customary Saudi partner. In the view of Sana’a, these privileges were not merely a favour bestowed by the Saudis but amounted to a legal right. 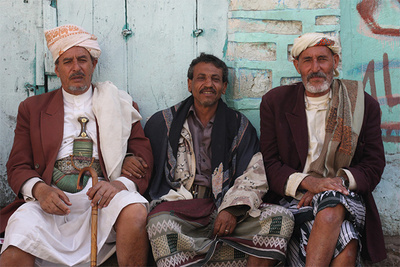 Together with dependants, the number of Yemenis living in Saudi Arabia probably approached two million at its peak. Although in the short term their remittances brought tremendous benefits to north Yemen, the longer-term effects were more debatable. In the first place, the remittances tied north Yemen’s economy to Saudi Arabia – which meant it would suffer if political relations deteriorated. Meanwhile, the influx of cash into Yemen from expatriate workers caused inflation and huge disparities in wealth where the families who had no members working abroad were the first to suffer. Agriculture declined as able-bodied workers drifted away from the countryside, leaving villages populated largely by women and those males who were either too old or too young to work abroad. Gradually, the delicate system of mountain terraces began to fall into disrepair, leading to soil erosion and further agricultural decline. Also based on past form, the overall effect of any Saudi involvement is unlikely to be positive. First published by www.moderndiplomacy.eu under title: ‘Yemen and Saudi Arabia – a historical review’.